Designer Laura Cahill wanted to make art without wasting new material. She did a bunch of research, and found out that used books are the most common unwanted objects; they're also notoriously hard to recycle because of the kind of glue bookbinders used to use. 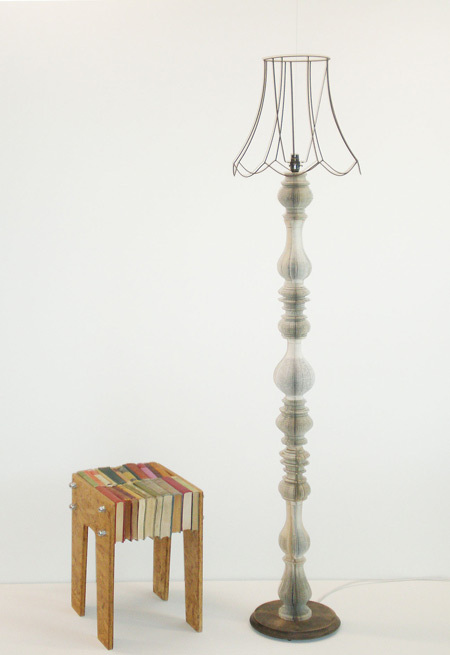 So she took her second-hand book collection and turned it into beautiful pieces of furniture. The bench is pretty self-explanatory, but for flower vases and lamp posts, Cahill uses a band saw to cut the books into desired shapes and sizes, and then wraps the spines around test tubes to make the cylindrical core. It's such a cool, eco-friendly concept.